Is it the Beautiful Colors in the clothing? Is it the Beauty of the Scottish People? Yes all of the above!!! Campbells and Walkers shortbread. 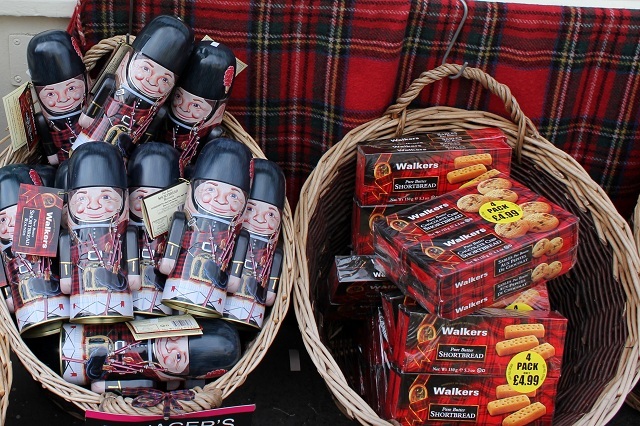 Last year I saw a blog and I'm sorry I didn't write the name down for future reference, but the blogger had a tin can designed just like a kilt. 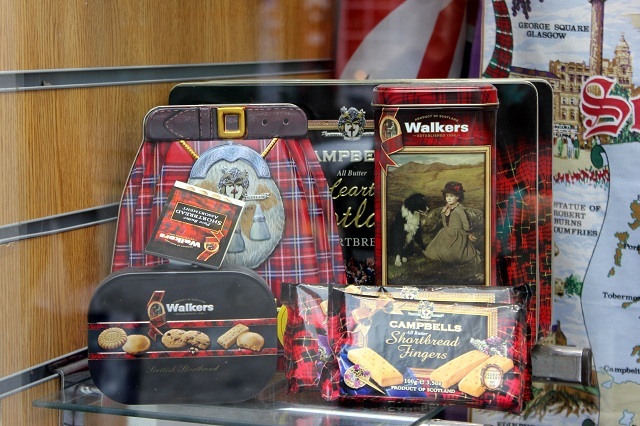 I was so surprised to﻿ see one of the Campbells Shortbread tins in this window. I would have purchased it but I had no room in the luggage. I love to go to World Market and buy the same packages of Shortbread Chocolate Chip Cookies I had at the Jury's hotel in Edinburgh, Scotland. 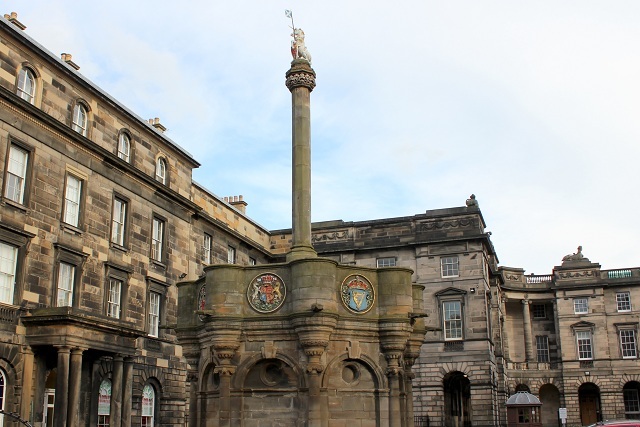 The Mercat Cross was the central meeting place where Royal proclamations and other official announcements were read. It served as a landmark for the merchants and citizens within the official hub of the city market. 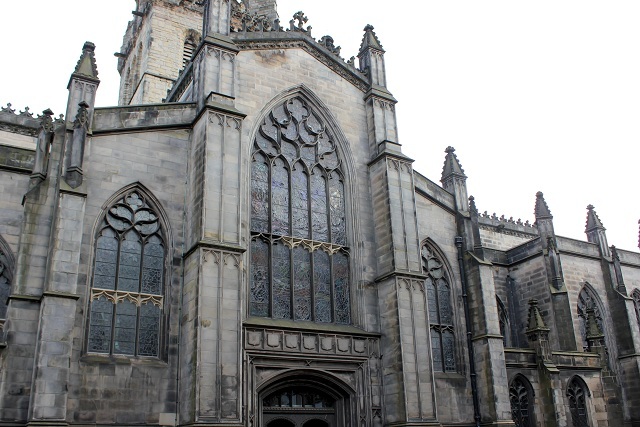 This church is Scotland's most important church. 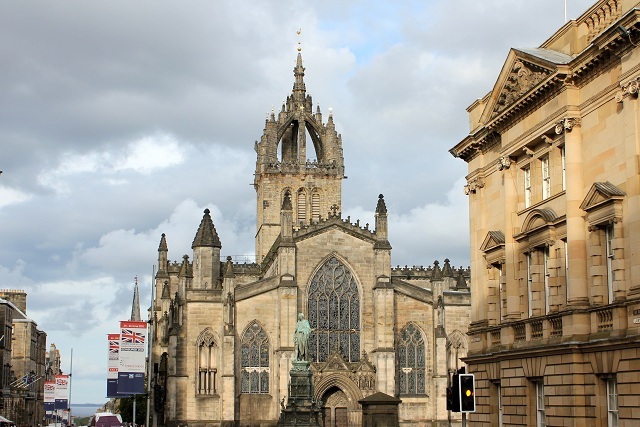 Its ornate spire-the Scottish crown steeple from 1495-is a proud part of Edinburgh's skyline. As the church functions as a kind of Westminster Abbey of Scotland, the interior is fascinating. Concerts include: organ recitals and visiting choirs. 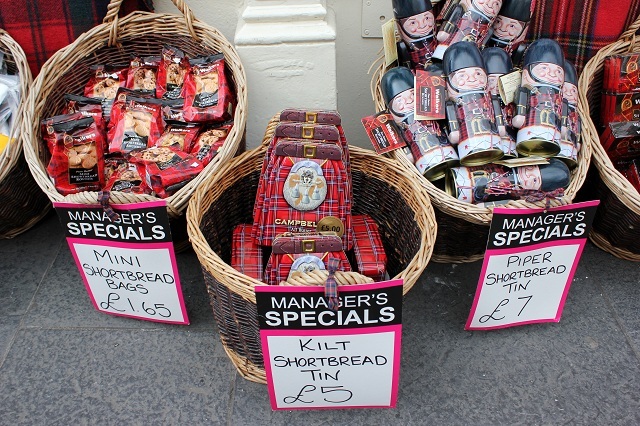 How about a Kilt Shortbread Tin? 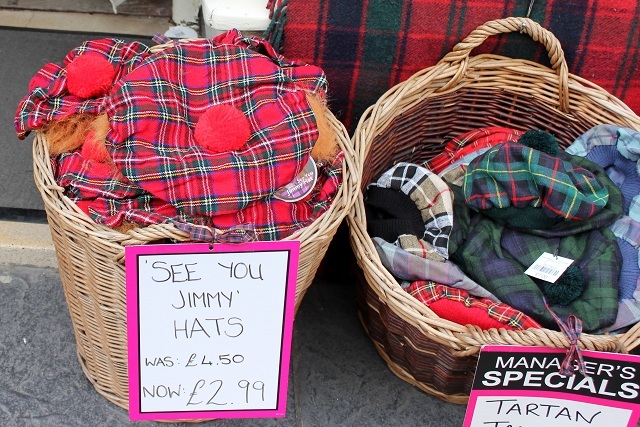 How about a 'See You Jimmy' Hats? 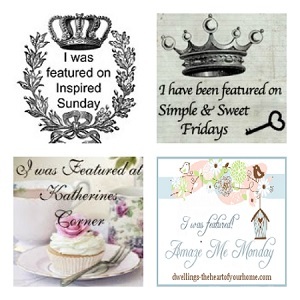 Check my photo on my sidebar. Do I look like 3M Scotch brand packaging tape﻿? 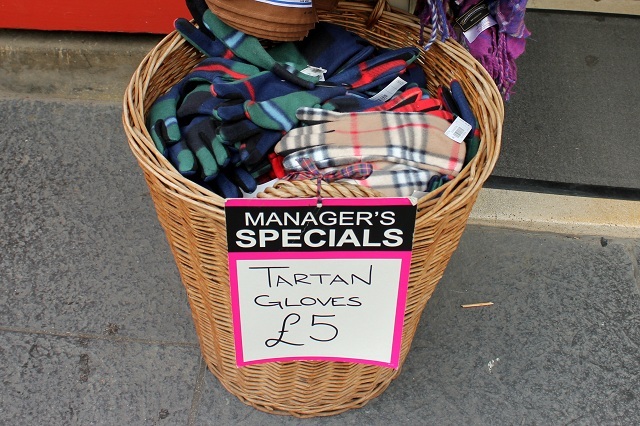 I wish now I had bought a pair of gloves. Wow! Do I like Kilts. All colors and sizes. Do you get my drift? 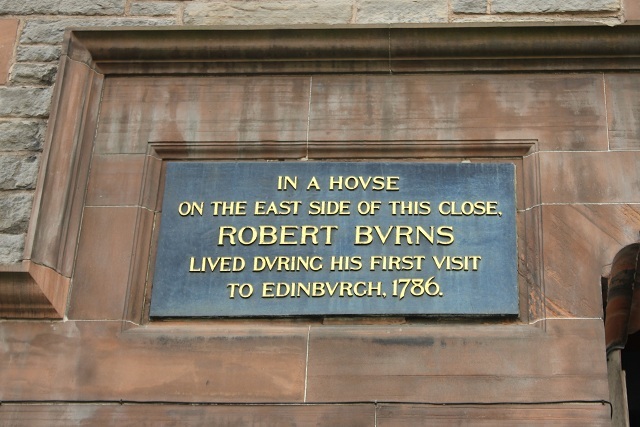 Robert Burns is Scotland's favorite poet. Robert Burns famous line "My love is like a red, red rose"-part of a song near and dear to every Scottish heart. 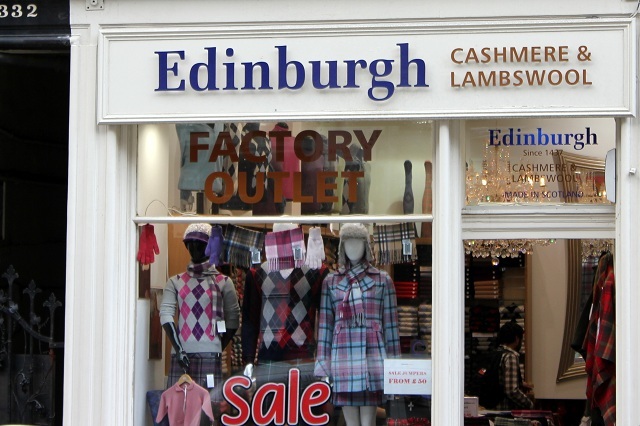 I was only in Edinburgh for one evening. 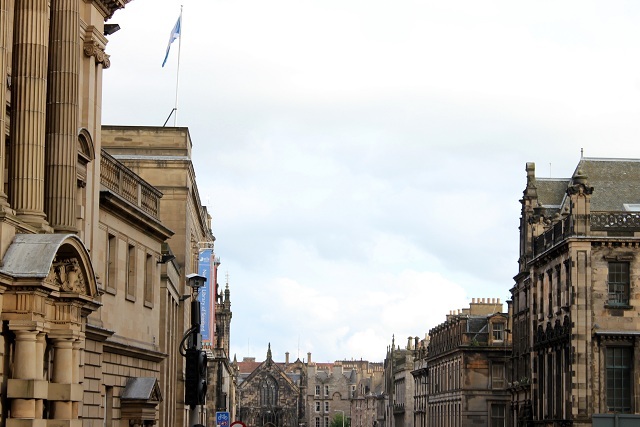 My friends and I walked The Royal Mile to the top of the hill where castle stands. 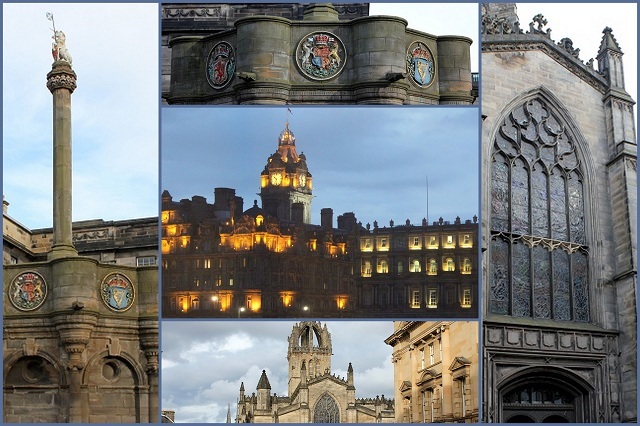 The Royal Mile is one of Europe's most interesting historic walks. 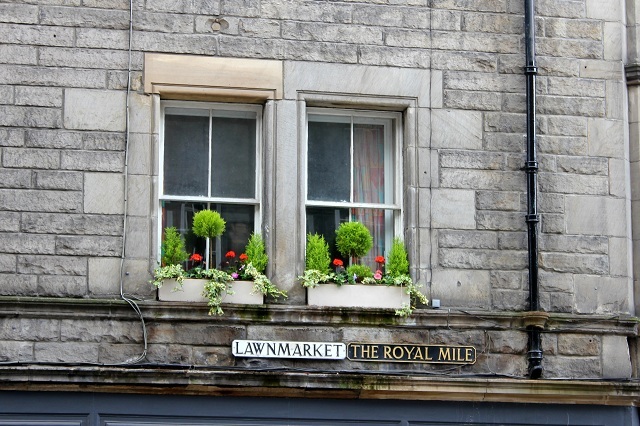 The Royal Mile is actually 200 yards longer than a mile. And every inch is packed with shops, cafes, and lanes leading to tiny squares. 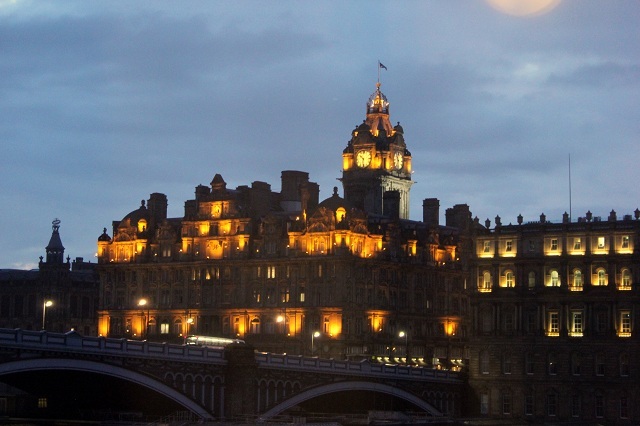 Oh what a wonderful evening we had walking the 'The Royal Mile' and as I was preparing for the next day's journey back to England I looked out my hotel window and saw this beautiful site of the city of Edinburgh, Scotland.﻿ Amazing. Please visit them and say hello! Hi, my first time here. 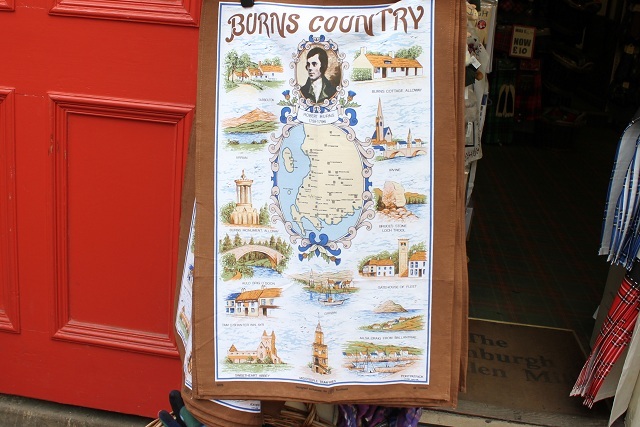 I love Scotland too, but i haven't been there. Since i was young it has always been in my dream, i just dont know if i can realize it still in this lifetime. Somehow it brings a sense of mystery which i still cannot fathom, maybe it still cannot be fathomed even if already there. Friends who went there already gave me books which i cherish! 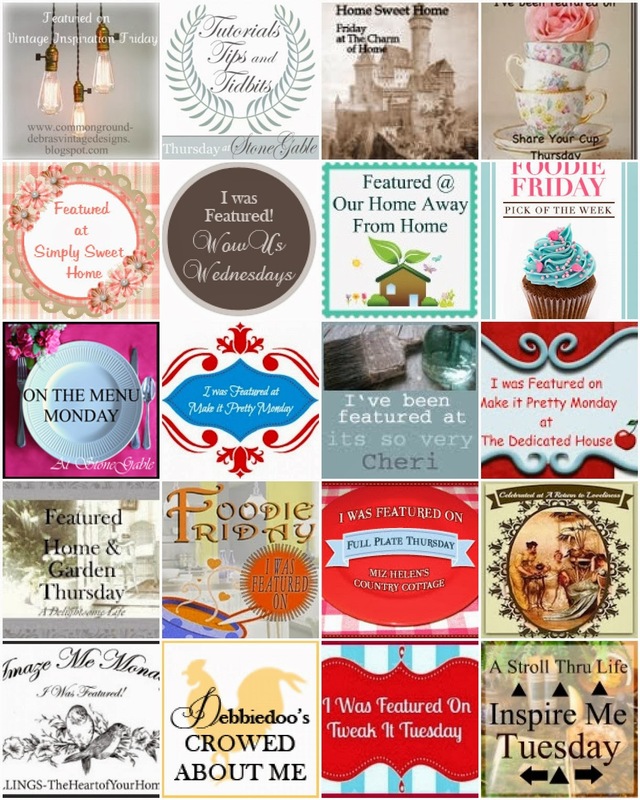 I have enjoyed your wonderful Photos ! Betty, it's been many, many years since we visited Scotland. I long to return, so thank you for sharing these wonderful photos of your trip. Oh my goodness! 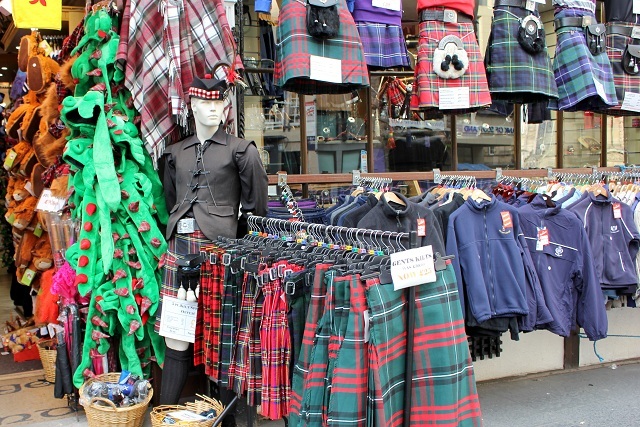 Now I want to go to Scotland too! All your photos are so beautiful and interesting. 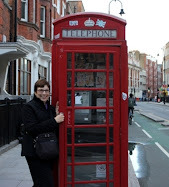 I have been to England many times, but have yet to go to Ireland, Scotland or Whales. Can't wait! 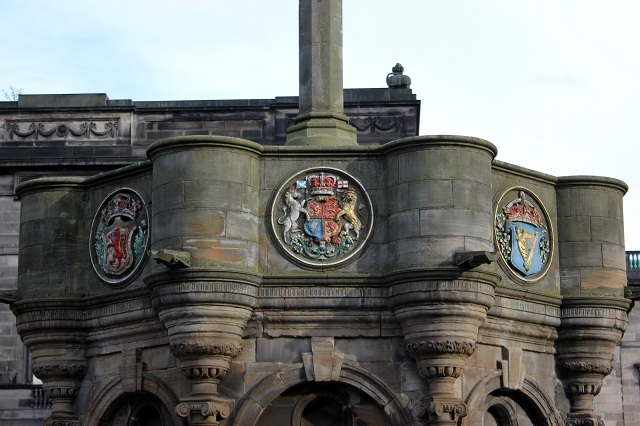 My mother-in-law immigrated from Paisley Scotland. We took her back home when she turned 75 years old. She is passed now; but I miss her homemade Scotch shortbread and the bit of the brough. Looking at your Edinburgh photos reminded me of this wonderful person who is now long gon. 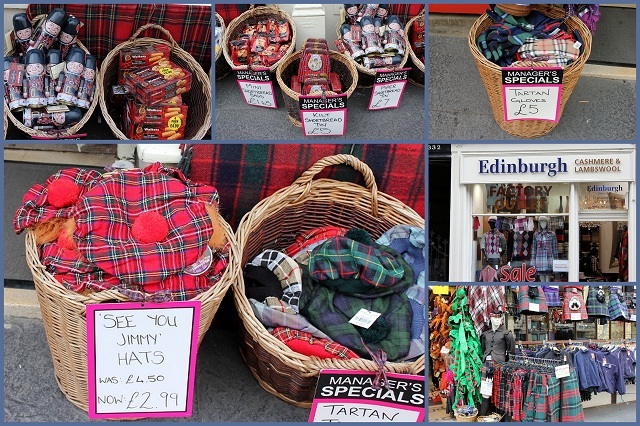 Oh I adore Scotland too! I was there only once. Thank you for bringing back such happy memories.